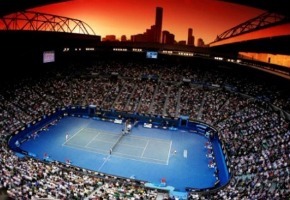 Improvements coming to Australian Open, AFL on Seven. As part of the Seven Upfronts there were two noteworthy improvements worth passing on to viewers. Australian Open fans will be getting plenty of tennis via second screens next year. Bruce McAvaney told the Upfronts guests that Seven will give 8 different camera views on second screens next year, each with their own commentary. That means you will be able to watch different matches as well as some backstage content. Seven has also announced AFL coverage will begin on Friday nights from 7pm right around the country. Of course the big question remains whether Seven sports will offer flagship events in HD instead of SD. There was no official announcement on that last night, but industry has been talking about change coming after digital switchover is complete, set for December. 7pm start for AFL coverage all around the country? That would be a massive delay for Western Australian viewers. Um… how does the watching different matches thing work on 7? Will we get a red button as well?? AFL coverage will begin on Friday nights from 7pm right around the country. I think the 7pm nationwide start is to counteract Fox Footy’s 7pm start. They already have a ‘preview’ show on Sat nights after the news, so why not Fri?? I hope Ten does this with F1 like the upcoming Australian Open on 7. 7pm around the country meaning….. 7pm EST and then 3 hr delay in the West for 7pm… I don’t care as I don’t watch football or FTA but still…. Deeeee-lay. Except I haven’t said 7pm EST.